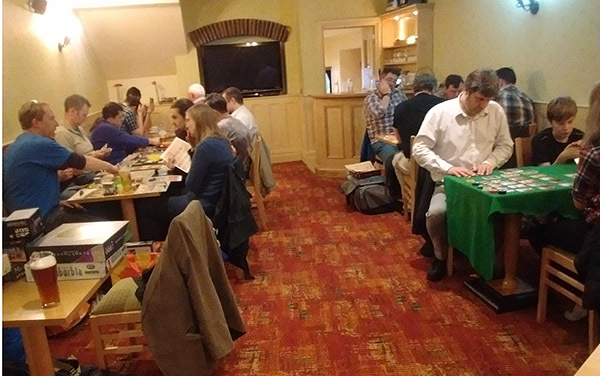 This year's event went very smoothly, with 108 paying entrants over the two days, and a fine variety of games getting an outing. There were several new attendees putting the games library to good use; I took the opportunity to try several recent games including Tempurra and Thief's Market, with which I was rather impressed, and made the most of the usual excellent food and well-kept Bridge Bitter. As is traditional, the players staying at the hotel got down to gaming straight after breakfast, in fact some were hard at it on Friday night. We raided the shop for a couple of tables and some extra chairs to neatly fill up the main gaming area. We had a small Bring & Buy by popular demand – this was in the shop's wargames room, run by the staff on the Saturday and by Simon and the Roleplayers (the popular beat combo) on Sunday as the price for borrowing the shop for their activities, this netted £12 for the Midlands Air Ambulance. Meanwhile, across the road in the hotel, a couple of new games were being demoed (the names of which escape me, sorry guys), and both Colin and Sally had a crack at the just-released Dropfleet Commander, sure to result in further battles in the shop when time permits. All in all, we had a relaxed and pleasant time, maximum enjoyment for minimum effort, just the way we like it.